I actually created the map from the dataset of 969 determination letters from PA DEP published by the Scranton Times Tribune. I restricted it to the 6 most heavily fracked counties nearest the Southern Tier. The black dots are gas wells. Each township is color coded by the number of complaints in the dataset. The map uses a log scale, so each color change represents a doubling in number of complaints. 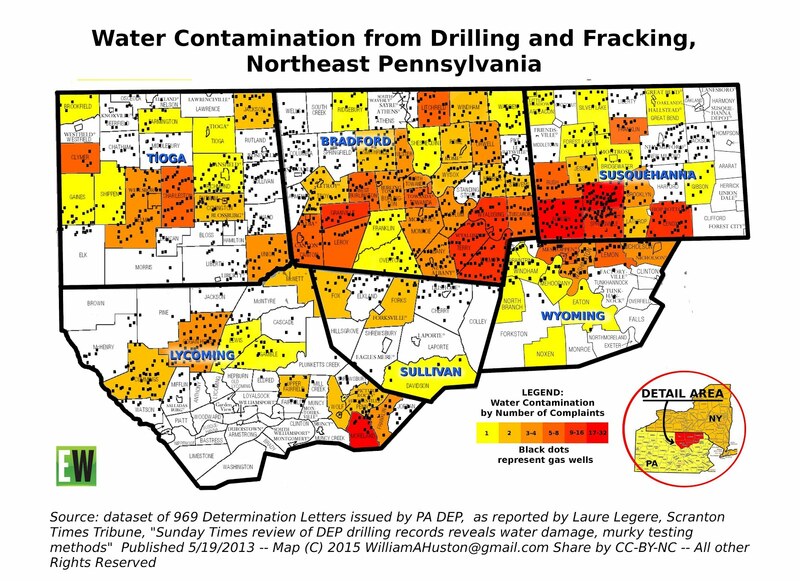 I think this map clearly shows that the contamination IS widespread and systemic! It's gotten over 2 thousand shares, so apparently others agree. All of which point out the extremely narrow scope of EPA's study, and/or how the Executive Summary seems be be contradicted by the actual data. > What the general public may not understand is just how many gas wells are involved in shale gas extraction. 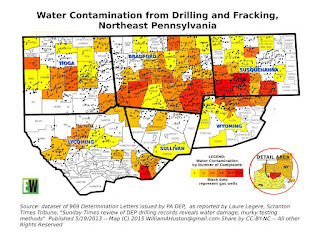 As we've already seen in PA (and other places), a single county can easily end up with hundreds or thousands of shale gas wells. So even if the risk per individual well seems acceptably low, when you multiply that risk by the large number of wells you end up with an unacceptably high risk county-wide and a game of Russian Roulette for individual residents. > Moreover, this problem also applies at the level of an individual living near a well pad, because the well pad is unlikely to contain just one shale gas well--it's probably going to have multiple wells. So you have to take the per-well risk and multiply it by the number of wells on the pad. On top of that, having multiple wells clustered together might increase the rate of cement failure for each individual well on the pad because they are all taking a pounding every time a new well is drilled and fracked or re-fracked. > Those responsible for the EPA's executive summary are hoping we will not do the multiplication. > Note, by the way, that even before you think about doing the multiplication, the general attitude of the executive summary is really quite callous:it seems to be saying that as long as the damage to water is not "widespread" or "systemic" it's no big deal. But what about the people who do end up drinking bad water? Do they just not count? >> I participated this morning in a webinar hosted by the USEPA regarding their draft hydraulic fracturing study draft, and I've taken a preliminary look at the study itself -- not to be confused with the executive summary. The report itself can be downloaded from http://www2.epa.gov/hfstudy. >> The primary reported conclusion of the draft study is that the EPA finds "no evidence for widespread water contamination due to hydraulic fracturing operations". >> About one of every dozen petroleum industry spills (8%) reached a drinking water source. >> Two-thirds of these spills (66%) contaminated soil adjacent to the drill pads involved. >> Two-thirds of oil and gas wells (66%) had cement gaps -- when they were new. >> Three percent (3%) of oil and gas wells had cement gaps where they penetrated drinking water aquifers. >> All the wells examined deteriorated with age, but the agency could not determine an average rate of breakdown. >> About one of every 250 hydraulic fracturing operations (0.4%) sent cracks directly into underground sources of drinking water. Until today's release of the draft report, this is the number which petroleum industry spokespeople have insisted was zero. Not only is it not zero, it amounts to thousands of incidents across multiple states. >> I noted (for now) one glaring deficiency in the report: the chapter on waste-fluids disposal made no mention of earthquakes triggered by underground injection of wastes in different regions of the country -- although there was an oblique comment about an uncertain future for waste disposal if underground injection began to be limited. Do our EPA scientists believe that earthquakes don't affect drinking water aquifers? >> How do we reconcile the documented evidence of widespread harm with the executive summary conclusion of harm that is not widespread? The evidence was collected by scientists, and the "spin" was written by politicians. Nothing about that is new to my experience. >> There will be more comments to come as I struggle through the details. > You received this message because you are subscribed to the Google Groups "NYRAD" group. > To unsubscribe from this group and stop receiving emails from it, send an email to NYRAD+unsubscribe@googlegroups.com. > To post to this group, send email to NYRAD@googlegroups.com. > Visit this group at http://groups.google.com/group/NYRAD.